Now that we know what a heat pump is and what it does, its time to get down to work! The first step Xringer took before he even received the unit was to look into what would be needed to get the job done. He did a lot of research and digging for the information and tools he would need. Check out his forum thread for more info. He ended up needing the following special tools for this project. Next, he selected a location that would be relatively close to where the interior heat exchanger was located. This keeps the lines between the inside and outside unit short, and reduces the cost of the install. Once he selected the location, he learned that he had to move his water spout over a bit to get it out of the way (see above). 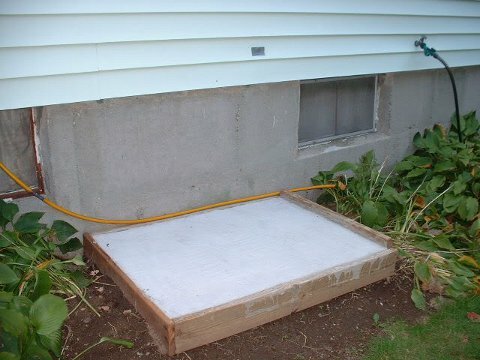 He then poured a concrete pad to mount the outside unit on. 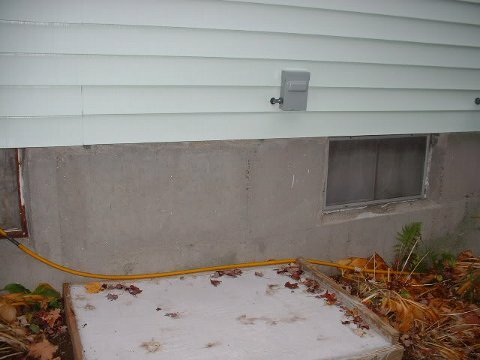 The last thing to do in preparation for the install was get electricity to the outside unit. 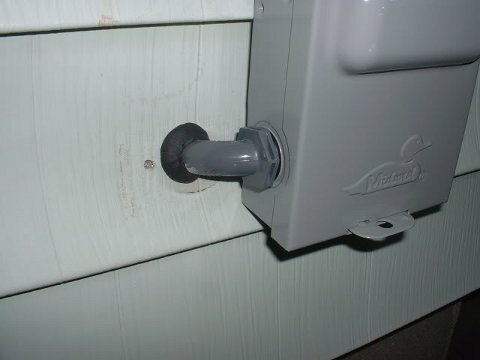 Using the old water spout hole, Xringer mounted an electrical box to connect the heat pump’s electrical connections. With these few things taken care of, things were ready to start being put together. A couple of tools that I never got to use, was the torque wrench & flaring tool. I left the line-set at 20 feet long, so no R410a would have to be removed, so no cutting of the copper was necessary. I left it long, in case I ever needed to move the system to another location. The sealant is actually a lubricant and can make the job a little tricky. After getting some advice from an experienced installer, I was afraid of over-torquing the fittings, so I tightened them up by hand. Figuring a prolonged pressure test would tell me if I left them too loose. None of the nitrogen leaked out, so I was satisfied.